Keeping the back seat organized and clean may be a lot easier than it sounds. 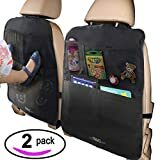 While some people use the back seat as a dumping area, you can get an edge by using one of the top 10 best cars back seat organizer in 2019. These backseat organizers can help you find what you are looking for in seconds. They say there is a place for everything and everything in its place. That old saying describes the backseat organizer to a T. They have pockets for cell phones, tablets and more. You can stay organized and save time. After you hook one of these organizers up, you are also protecting your car seat’s fabric. They provide a cover, so your passengers’ muddy feet do not mark up your seats. You get a lot from using one of the best back seat organizers. 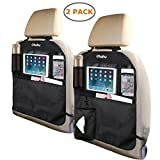 Both seats can be protected with this 2-pack backseat organizer. You get touch friendly pockets for up to 10” tablets, a pocket for cell phones and item. Plus, you can protect your seat from muddy feet. The approx. 25 by 18-inch kick mat adds dirt protection to its list of capabilities. Also, if the kids get thirsty as you drive, there is a place that holds a water or juice bottle. Then the waterproof organizer cleans up easy and stays attached to the seats by elastic straps. The rugged construction materials are tear resistant and durable as well. One drawback is that the elastic straps may not be as tough as they could be. Another is that these organizers may arrive with a foul odor. Finally, there is no double stitching to reinforce the pockets. These might tear quickly. Hold your child’s favorite toys or keep them entertained with a movie. This backseat organizer has many pockets at your service. The touch-friendly tablet pocket will hold up to an 11” tablet for broadcasting your child’s favorite shows. But you don’t have to use these organizers just for kids. If you are on a long road trip, you can keep maps, drinks, food and other travel items within easy reach. 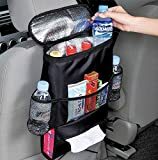 Your travel days should be a lot easier with this multi-use backseat organizer. Plus, the neoprene pockets stretch to make for easy use. There are pen pockets and a key hook as well. 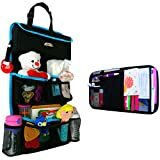 One negative aspect that comes with this backseat organizer is that the pockets may not be as deep or as wide as you would like. Another is that a toddler may not be able to reach their favorite items since it is a fair distance away from them. Your back seat can look very organized and well planned out with this backseat organizer. With a place for tissues, you can quickly wipe up any mess your kids make. Then the pocket for a smallish tablet and 2 for cell phones handle your electronic devices safely. Also, there is even a place on the approx. 24 by the 16-inch organizer for your umbrella. No more delays searching for rain protection. Plus, you can hold jars of food or water bottles or even your passenger’s sunglasses. This backseat organizer is made from waterproof, anti-kick, wear-resistant, and anti-scratch PU fabric. One disadvantage to this backseat organizer is that if the tissue slot is empty, it is a tempting toy to play with when a child gets bored. Also, the design of the tissue slot is awkward and hard to access. One way to keep your backseat from becoming a dumping ground is to use this free sitting backseat organizer. It has enough pockets to hold many of your child’s favorite items and more. There are large main pouches for books, large toys and so on. Also, it is strong enough to hold adult items and keep them from rolling under your seats. You save time by not having to search for ‘lost’ items. Handy handles work with your seat belts to keep the organizer from sliding around as you turn corners. Those same handles make moving the organizer from car to car simple and easy. The first drawback is that the fabric construction material may fray quickly. Another is that you cannot put this organizer in the washing machine. It will tear apart. Finally, it is aa bit bulky for some smaller cars. Kids get bored in the backseat. When they do, they like to kick the seat in front of them. This backseat organizer comes with a kick mat to protect and keep your front seat clean. Then these kick mat backseat organizers are attached to the front seat by elastic straps. After you put these on your front seats, you get a few pockets for necessary items. Unfortunately, there is no touch-friendly tablet pocket. The 4 pockets will hold tablets, cell phones, toys, drink bottles and more. They will help keep your backseat looking nice, clean and well organized. One negative element to these kick mat backseat organizers is that the dirt from your kids’ shoes will fall into the pockets. Another is that the seams are not reinforced and can tear easily. Last, the organizer bunches because of the elastic straps. After you get the elastic straps fastened and the backseat organizer in place, you receive a lot of storage area for your travel items. A bottom zippered pouch can hold valuable items or other things you do not want to lose. Mesh pockets can hold bottles for your kids. Also, you get a large top pocket to store larger items you need in the car. It will hold items from tablets to maps with ease. A reinforced top keeps the organizer from bunching up as it gets weighted down. Strong construction material keeps it long lasting and very durable. The first disadvantage to these backseat organizers is that the strap’s buckles may not fasten easily. Another is that the mesh pockets are too little for standard sized water bottles. Last, the other pockets may not be as deep as they should be. Keeping the kids entertained on long trips is much easier. Thanks to the large tablet pocket that will hold up to a 10” tablet. The touch-friendly pocket lets you or your kids make the adjustments needed. Plus, you also get access to all ports on your tablet. In addition to this feature, you get elastic tops to hold bottles and other items securely inside. Made from waterproof polyester, you get a durable yet easy to keep clean backseat organizer. Oh, and a Velcro strap secures the main bottom pouch for you. You shouldn’t lose anything with this backseat organizer on the job. One drawback is that you may find the tablet pocket tight fitting and you have to remove your protective case to get it inside. Also, the drink pouches seem to be leaning towards the small size as well. This backseat organizer is not large, but that fact doesn’t stop it from doing a grown-up job. First, its water bottle pocket is insulated. You can keep your cold drinks cold as you drive. Second, a bottom tissue pocket keeps clean up tools handy and easy to access. Finally, the mesh pockets hold those cold-water bottles as you drink from them. They keep you from opening the insulated pouch too often when you need a sip. 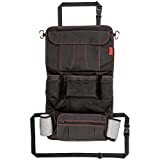 This wear proof backseat organizer can hold a variety of items you need as you drive down the road. One negative aspect to this backseat organizer is that you cannot use ice in the insulated pouch. It will leak. Another is that the quality of stitching may be on the inferior side of things. Finally, the lower strap may loosen and not remain tightly attached to the seat. The bright blue trim adds a little color and pizazz to this backseat organizer. It is attractive and still able to hold a variety of items you need in your car. Plus, its almost universal fit makes it compatible with almost every vehicle on the road today. On top of this, the waterproof construction material is quite strong and advertised as indestructible. Your cleaning time should go by faster as well. Also, there are enough pockets on this backseat organizer to hold toys, cell phones, keys, pens and a lot more. This organizer spares you the trouble of searching for needed items. One of the main issues with this backseat organizer is that everything about it seems small. Pockets are small, straps are small, and the overall size is small. You can get a lot of items inside, but they need to be small to do so. Having a backseat organizer do double duty is a good thing. Not only can you keep your back seat organized, but you can also use this unit as a seat protector. Just empty it and flip it over the seat when you have more passengers than usual. Your seats stay clean. As a backseat organizer, you can use your tablet to entertain your kids and stick the pockets with snacks and drinks. Measuring 19 by 27 inches in size, your front seat should be covered and protected from dirty feet. How you fill its multiple pockets is up to you and your situation, but you have pockets for many items. One negative issue is that this backseat organizer may be too short for SUV sized seats. Also, the construction material may be on the thin side and you may have to remove the tablet cover to get it inside the pocket. Why use a backseat organizer? There are many reasons why you should turn to a backseat organizer to handle your driving issues. 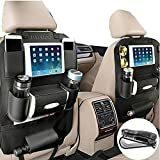 These reasons are motivation to switch to one of the top 10 best car back seat organizers in 2019. Keeps the back seat clean- no more using the rear seat as a dumping ground where something important will get lost. Keeps important items handy- you won’t lose time searching around the interior of your car for necessary items you need at the moment. They are just an arm’s length away. 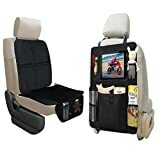 Protects your front seats- some of these backseat organizers come with kick mats. This feature makes sure the back of your front seat is not dirtied or damaged by bored kids. Facilitates cleaning- with the included tissue holder or extra pockets, you can keep cleaning materials close and easy to access in case of an accidental spill. Helps entertain the kids- and we do not mean that they have an extra toy to play with. Most of these organizers have a tablet pocket. This enables you to show movies, etc. on long drives. Keeping your kids from getting bored and kicking the seats. 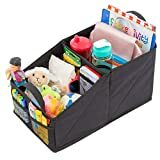 Holds snacks- instead of making stops along they, these backseat organizers can keep food and drinks close when you or your kids get a little hungry. Don’t let your back seat turn into a garbage dump. Keep it clean and organized with one of the top 10 best car back seat organizers in 2019. These organizers should have enough pockets to hold those important items you need on any road trip. Plus, they work to make sure your kids have toys, coloring books and more at their disposal. The pockets can hold drinks, snacks, keys, and other travel items and keep them from rolling under the seats. To stay organized in your car, you need the right equipment. Just find the right organizer for you.